Thanks Proof , lemme go get dozens of it, I have alot of movies to download. Since the #200 for 1gb stopped working for me, I just dumped 9mobile. How can i use the Glo Oga sim? Not making sense at all. just for 4.5gb i have to get a new sim. I can’t wait to try this out.. Looks interesting. But pls be warned, airtel smartconnect 5.0 is a scam. They will removed the double data 24hrs after giving it to you. It is not a lie, dem go thief your data like national cake. It seems they just want to sell sim cards.. As there will likely be nothing stopping the new buyers from dumping the sim after exhausting the data. marketing strategy. why 5 days? I think this is a trick to get more new subscribers hence the target for new sim. any way will try when I have major things to download. I used to love 9mobile, can’t remember how many sim have ported to 9mobile. then where does the 5h apply? So it’s just once in new sim? They are just trying to get more new subscribers. Cool but I think I’ll prefer sticking with my #200 for 1GB plan. 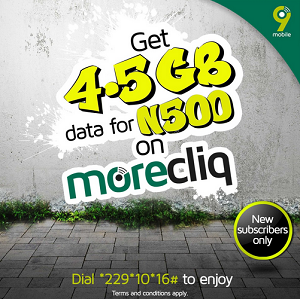 I can actually help u get additional 1.5Gb to the 4.5Gb bringing us to a total of 6GB for #500 naira…ask me how? This is my little contribution to this blog.